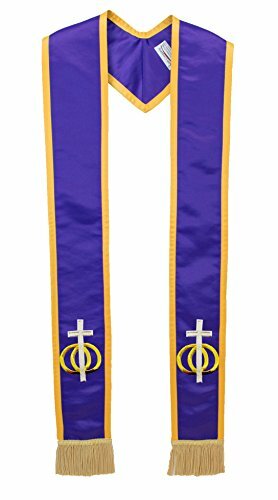 This is a clergy stole made of 100% polyester ultra satin with Wedding Unity Cross symbol on the front. Comes in Black (with Fringe), White (with Fringe), Blue (Standard), Pink (with border), Purple (with Honor Gold Border & Fringe), White (with White Border and Cream Fringe), White (With Cream Border and Black Fringe), White (with Rhinestones - Deluxe Dazzling version), White (Double White/Black Border with Black Fringe), and Red (With Black and White Double Border and Black Fringe)..
Our stoles are made using the highest quality fabrics and will be something that you will be proud to own for a lifetime. Washable 100% Polyester Heavyweight Bridal Ultra Satin Fabric. All Stoles are handcrafted by The Sash Company in the USA at our manufacturing facility in Upland, California. We take pride in the quality of our fabric, stitching, embroidery, and our customer service. We are the official sash company for Miss America pageants, and many universities throughout the United States. If you have any questions about this product by The Sash Company, contact us by completing and submitting the form below. If you are looking for a specif part number, please include it with your message.